Meet Dylan Lowery, our talented videographer and pizza-hater! 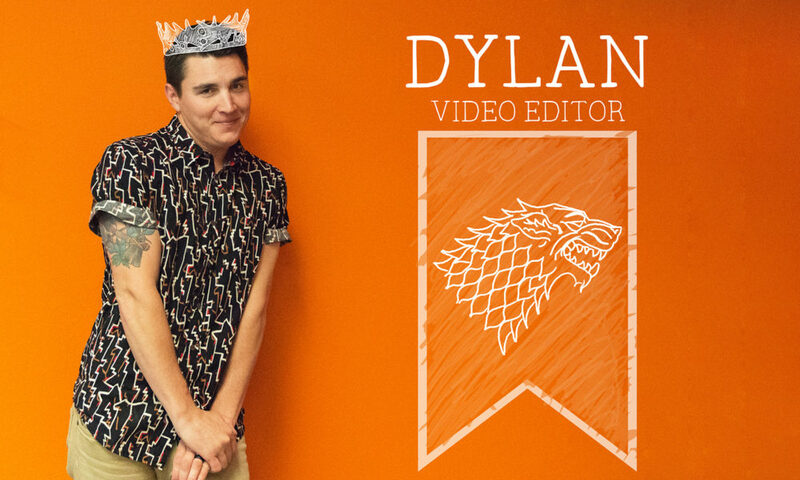 Whether he’s in or out of the office, Dylan’s passion lives behind the camera. More often than not, you can find him outdoors with a camera in hand taking pictures of whatever nature throws in front of him. Dylan has a creative eye for film that makes him a valuable part of our RD Thomas team. Read on to learn more about our outdoor enthusiast! The fact that you never know what the next project will consist of. We could be asked to shoot anything; so I enjoy the surprises and constant change. I didn’t exactly plan on going into advertising, but since we do most of our own production in-house, I found a place where content creation is needed! It depends on what I’m feeling like watching at the time. I’d say Netflix for movies/documentaries and Hulu for TV shows. I’d definitely become a lake or beach bum. I’ve always been a fan of The Range. Good ol’ golf and washers. I love photography and spending time outdoors. You can normally find me roaming around somewhere with my camera. Easygoing. I never really experience road rage. I will also say that I prefer highways over city streets. Being more than just content with your current situation/circumstances. I wouldn’t mind a chat with James Franco. Most people are scared of the Game of Thrones world, but I’d take it on. My family often meets up to hang out at the lake, beach, or mountains throughout the year. I love every trip we take together. La Spezia, Italy. Cinque terre was so gorgeous. The Forest of Knives in Madagascar. Picnic on the moon with my wife, Emily (it could happen in a dream). I’m conflicted! Mac for work/media and PC for games. I would much prefer going to the World Series, so I’m gonna sell the Super Bowl tickets. Some land on Lake Amistad. 1450. I’d like to spend time with Native Americans right before European contact. I recently had one of my pictures published in a Texas Parks & Wildlife magazine. It was small on the page, but at least I made it! I’m gonna have to go with both. Brisket from Evie Mae’s BBQ. Right now, music. I haven’t paid too much attention to film until recently, so this could change one day. That hairstyle where you use gel to spike up only the front. I rocked that baby for years. Climb one of the ancient pyramids. My music is full of alt rock, R&B, and Texas country. I got to see my grandma this weekend. She just had a major back surgery so it was good to see her doing well. I want to be able to love my job and constantly grow as an artist. If successful, I’ll be able to take care of my wife and future family. I think I’m going in the right direction; so yes! I wanted to be a professional baseball player for the first 17 years of my life. I never expected I’d become a videographer.